We regularly update news editors and other interested parties with our news ticker. All newsworthy information at LASER COMPONENTS is available here first! You will find the press releases in chronological order below. If you are looking for press releases from a specific department, use the navigation bar on the side. We differentiate between general company news and news from the product groups: photodiodes, IR components, photon counters, lasers, measurement devices, fiber-optical components, optics, and laser accessories. Bedford, NH: LASER COMPONENTS USA, specialized provider of laser and optoelectronic components in the US and Canada, demonstrates for the first time the ALBALUX FM, world’s first laser white light module with bright and highly directional fiber optic output for precise and contrast-rich illumination in next-generation medical and machine vision applications. The company unveils its latest development at the SPIE Photonics West show, February 05 – 07, 2019 in San Francisco, CA, Booth# 1751. ALBALUX FM is set to spark a new innovation wave in illumination solutions for medical endoscopy, surgical headlights, manufacturing processes, and 3D machine vision. The possibilities are manifold with reliable high optical power, remote fiber-optic beam delivery, and safe drive electronics in a compact enclosure. A key component of ALBALUX FM is the award-winning LaserLight technology from SLD Laser. Based on GaN semi-polar blue laser diodes, LaserLight generates brilliant white light that is more than 10 times higher in luminance than today’s LEDs, yet with minimal power consumption and long lifetime. 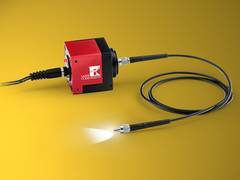 To maximize light transmission and precise beam directivity, optical fibers are incorporated that enables unprecedented >150 lumen CW output with sharp narrow edges. This results in enhanced vision that provides faster processing times and more reliable monitoring on the manufacturing floor, and improved diagnostics and patient outcome in medicine. ALBALUX FM is designed to offer the user full flexibility in both standard and custom configuration requirements. The plug-and-play module features custom-designed electronics to ensure safe operation of the LaserLight diode. “This all-in-one solution will break the status quo with traditional lighting and offers system integrators quick time to market” says Mr. Gary Hayes, CEO of LASER COMPONENTS USA. “Our experience in the areas of optics, electronics and laser technology combined with know-how in mechanics, housing, and fiber-optic technologies allows us to quickly respond to customer’s inquiries and emerging market opportunities” Hayes added. Would you like to receive regular updates and information on our products and services? Subscribe here for our free press service and stay up to date.